Defining Moment, Part 13: Final Evaluations – Love. Life. Practice. Everybody, sooner or later, sits down to a banquet of consequences. It’s one of the key principles of personal development, set down everyone from Aristotle to Covey: you are free to take action, but you are not free of consequences of those actions. Many a parent has shaken their head as they watch their children figure this out (sometimes repeatedly). Then again, many a rebellious child has looked up from their banquet of consequences with a defiant gleam in their eye and said “Yeah? Well it was worth it!” as they take up another bitter mouthful. That’s what we’re hoping for with the Defining Moment. We’re hoping, when it’s said and done, that you’ll look at the results of your experience and see a whole banquet of consequences. We’re coming up, next week, to a Very Important Question, and so it’s worthwhile to pull out all the notes we made before we did the Defining Moment and checked out just how good our predictions were. A wise friend of mine believes that the key to successful relationships is equality of expectations. That is, if both parties know what to expect from each other and that’s what they actually get in reality, it will go well. The same relationship applies to your Defining Moment. Was it what you expected? Don’t feel bad if it wasn’t. We (humans) are really bad at predicting what makes us happy. Dan Gilbert, in his book Stumbling on Happiness, blah blah, blahblah. OK, look, the reality is: everyone I know who’s done this – myself included – has actually ended up enjoying their Defining Moment more than they expected. I always say that bit about “we’re bad predictors” just in case it doesn’t go that way sometime. But honestly? Way back in the beginning we made sure that the Defining Moment was rooted in passion. That’s in our gut, and your gut usually knows what you like, even if it can’t quite make your brain express it. It’s likely that when you went through your Defining Moment you totally effed that ineffable something. It’s likely that you’ll actually discover that no, you didn’t expect to like it that much – nor did you expect the ways that you liked it. But please, if you try this out and your Defining Moment turns out to be less than you expected, let me know. I’m interested in someday finding out what that might be like. The implications fall into two categories: Expected and Surprises. We’ve already had a list of possible implications, and you can go down the list saying “Hmm…yep, that one, that one…no, that didn’t happen, but that did…” That process won’t take long, because you’ve already got the notes. But then there’s the Surprises. Those are the implications that you didn’t predict. 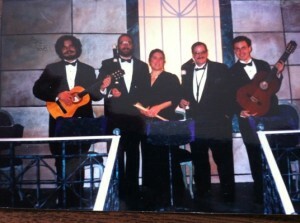 For example: I agreed, almost twenty years ago, to perform with some other medieval musicians for a University play. Medieval music was my hobby, nothing more; I was busy being a single Dad and working in childcare. It will be fun, I thought, just a lark. What I didn’t expect was that the minute I walked backstage the entire ambience of The Theatre would fill my senses, and lead me to eventually change my major (twice!) and end up with a degree in Dance. That’s what I mean: an implication that isn’t expected, that means that something in your life is going to change because of what you’ve done in your Defining Moment. It’s actually a pretty scary moment; it’s like that time a certain someone walked into a room and your eyes met and something deep inside said My life just got a bit more complicated. That’s what happened to me when I walked backstage; I knew, deep down, that this was something I needed to have in my life. I spent months fighting it, telling myself it wasn’t reasonable or practical or realistic. All of those things were true. But it was also necessary. That’s something about the Defining Moment – it’s a great way to learn more about what is necessary for you to be fulfilled in your life. Unfortunately, what is necessary is often unrealistic, impractical, and unreasonable. That’s why blogs like this one exist. I promise, we’ll come back to this later. Then just let your brain flow. “The performance came off well. Getting a babysitter was hard. My tenor recorder doesn’t want to stay in tune. Our rehearsals were fun!” Just go through your brain, adding things to the list, and for each one, it either worked, or it didn’t. If you find yourself writing things that you’ve already put in Expectations or Implications, then you’re getting a little off the beaten path. Expectations were about how you felt about things. Implications were the results of things. The Effectiveness Evaluation is simply taking it action-by-action and asking yourself: did this work? All of this is leading up to what we’re going to talk about next week: the Big Question. And when I say big, I mean it. It’s a doozy! Huge thanks to my newest Patron, Tara! Want to be as cool as she is? Sign up on my Patreon Page!